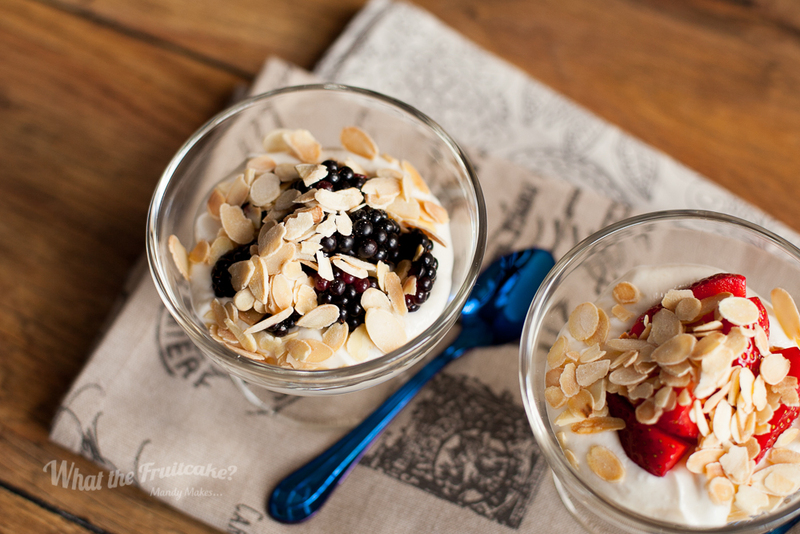 Protein Yoghurt with Berries — What the Fruitcake?! Growing up, we very seldom had dessert after a meal. Maybe there'd be something for the odd Sunday lunch, but generally, we weren't a dessert eating household. I'm not sure why this was the case, but I didn't feel hard done by. But, we always had big tubs of different flavoured yoghurts in the fridge. In South Africa you buy your yoghurt in 1l tubs. None of this 500g nonsense! My dad's favourite was granadilla, which is what us South Africans call passion fruit, true story. I quite enjoyed that flavour, especially because of the little crunchy seeds you'd get in some of your spoonfuls. But my absolute favourite was (and still is!) peach or peach and apricot. And on the odd occasion it was bought, black forest which had little bits of cherry and flaked chocolate in it. So good! So I guess, in a way, yoghurt was kind of our daily dessert. Except it wasn't. It was also something I'd sometimes have after school or on top of my cereal in the morning. We went through tubs of the stuff! As you've probably guessed, I still love my yoghurt, so being able to work it into my diet is just awesome. Who said you can't eat stuff you love when being careful about your food? That said, I don't have just any ol' yoghurt. Nothing with added fruits as that normally means there's added sugar in there. Actually, Glenisk do a lovely natural yoghurt with added fruit that has no added sugar, but I digress. What I eat these days is plain Greek yoghurt. It's thick and creamy and I love it. I'm able to work in full fat Greek yoghurt into my diet, but sometimes I'll use a 0% fat if my other fats have or will be high on the day. My favourite brand is Fage. I thought they only had a 0% fat yoghurt in Ireland, but I came home one day with what I thought was a 0%, and looking at it at home, I realised it was full fat. And, wow, just, wow. It's more like a creamy pudding than yoghurt! Anyway, now I keep both kinds in the fridge. Of course, you don't have to buy Fage, but just be aware that not all Greek yoghurts are created equally. Glenisk do a lovely, more tangy full fat and low fat plain Greek style yoghurt (and I didn't know this, but they can't call it Greek yoghurt as it's like champagne or cognac, it has to come from the country or region to be called Greek yoghurt.) Liberté is also good. The thing to look out for are any other additives, things like guar gum, or any thickeners and starches. All these added things aren't necessarily bad, but if you're being careful with your eating, having those extras in the yoghurt will affect your numbers. And who wants to sacrifice other carbs because of the unnecessary additives in a plain yoghurt? No, the only thing you should find on a decent and proper Greek or Greek style yoghurt is dairy and various friendly bacteria. As for this snack (or dessert) idea, it's pretty simple but I always look forward to having a bowl. Berries are a more favourable fruit than other kinds when watching your weight as they're lower in carbs. This suits me just fine, I love berries. Berries with yoghurt is especially good. I've also added in a bit of vanilla whey powder to these snacks/desserts. The whey already contains sweeteners so there's no need to add any other sugar. And of course, an extra bit of protein which is always a bonus. This snack would also be delicious using other flavoured whey powders like strawberry or any other fruity variety. I also enjoy different textures in food so adding the toasted almonds is a combination of texture and flavour. I also always feel quite sad after eating a measly few nuts by themselves as a snack, so when they're with something a little more substantial, I feel like I'm not having to eat like a bird! This protein yoghurt with berries is pretty simple, but simple is good! Easy to prepare, good to eat. Without a doubt, this is one of my favourite afternoon snacks or desserts! I don't normally eat mine from cutesy bowls like in the pics, I just have the yoghurt mixed with protein powder and berries in a small plastic tub, and the almonds in a separate tub (to keep their crunch), then when snack time hits at around 15:30, I throw the almonds over the top of the other stuff and eat. You can mix everything up the night before and keep in the fridge to take to work, but again, keep the almonds separate otherwise you lose their crunchy texture. Like I mentioned in the post, try other flavour whey powder to mix things up a bit. Would be great with strawberry or any other fruity flavour. I used Bulk Powder's Pure Whey Isolate 90 vanilla whey protein powder & Fage full fat and 0% fat to work out the macros. I am not a professional dietitian or in any way an expert on diet and health nutrition, these recipes are suited to my own personal eating plan and may or may not fit in with your own personal eating plan. Please check with your own personal trainer / coach / doctor / dietitian / etc. to see if these recipes are suitable to you. Posted on September 7, 2015 by Mandy Mortimer and tagged Snack Dessert Treat Protein Fruit Berries Almonds Greek Yoghurt Yogurt Breakfast Whey.